Up for Sale is a set 4 x JAGUAR X308 SPORT 17" wheel & Pirelli tyres - Upgrade your V8 or replace your Metric tyres. 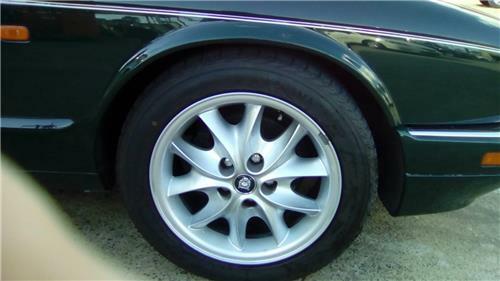 These wheels are off an X308 (1999) & are 17" diameter fitted with 265/40/17 tyres. If you are replacing your XJ40 metric tyres these rims are a better replacement (rather than paying $595 a tyre, if you can get them) & closer in diameter than putting on a set of 15" wheels. The wheels are in good condition but one has some paint that will need touching up (see photos) Tyres will need replacing as they are low.